According to the Chinese horoscope, those born in the Year of the Goat, as shown in our poster, are loving, charming, compassionate, tender-hearted, gentle, artistic and elegant. Here are two goat notebooking pages to print, ready for your farm animal topic! Here's some cute story paper with a lovely goat illustration, all ready to be coloured in. Choose from lines or handwriting lines. Use this goat writing page to write stories, record your research, or for any farm theme projects. Print this Year of the Goat booklet - choosing from lined or blank versions - and the fold it up following the instructions here. It takes moments to do and kids will enjoy colouring in the picture and then filling up the booklet with interesting content! Children born in the Year of the Goat will love to have a copy of this little bookmark, which lists the typical characteristics of a "goat" person. Do you agree? Just print this pretty Year of the Goat card onto A4 card or good quality paper, then fold in half. Hey presto, you have a Chinese New Year greeting! 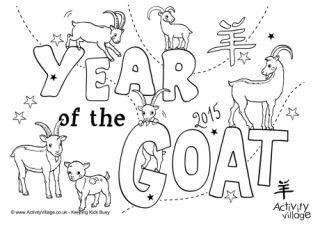 This pretty Year of the Goat poster will brighten up your classroom or home this Chinese New Year! Print it out with your printer on "borderless" settings for the best result.